The popular on-wheels experience is rolling for San Diego on Jan. 6. The popular on-wheels experience is rolling for San Diego on Jan. 6, and Culver City, Oxnard, and Valencia later in the month. SATURDAY, JAN. 6: Fashion Valley Mall at 7007 Friars Road is the spot, 10 a.m. to 8 p.m. are the hours, and several "limited-edition collectibles and edibles" will be for sale. It's just a one-day visit, so make sure you stop by if you want to pick up a new bow-shaped water bottle, one that's been "newly designed" (surely you'll be the talk of your Hello Kitty-obsessed pals once you pull that out at the next hike). 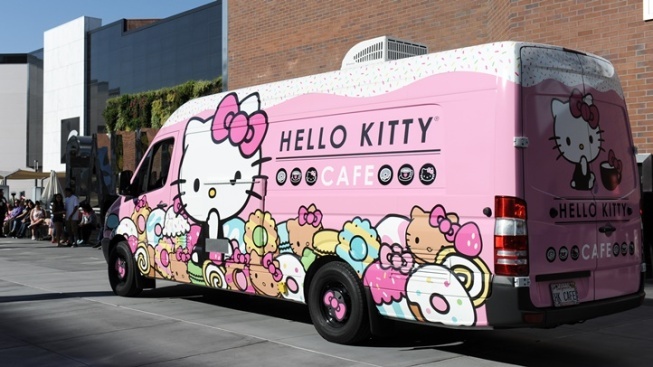 For details, visit the Hello Kitty Cafe Truck Facebook page. And keep on the lookout: Culver City, Oxnard, and Valencia are all on the truck's January 2018 itinerary.